One of our recent projects involved picking a part off a moving conveyor, and packaging it in various forms. The production machine, which was also built by Mass Automation, assembled the parts and delivered them onto a conveyor. The new packaging machine had to inspect and locate these parts, pick them off the conveyor, and place them into one of multiple packaging forms. 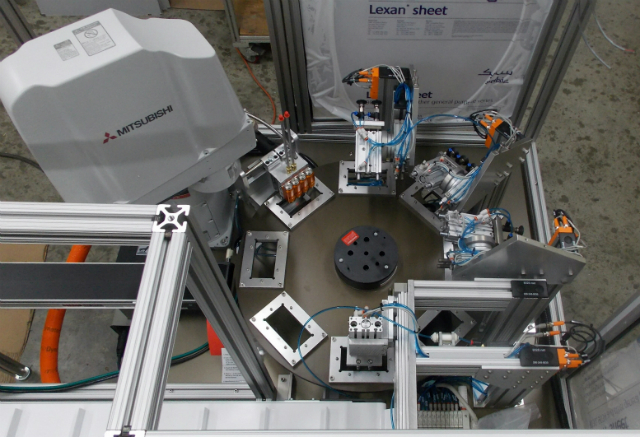 We accomplished this task using a Cognex vision tracking system, rotary encoder, and a Mitsubishi SCARA robot. The robot uses location information provided by the vision system, and travel speed provided by the encoder, to track the part as it moves down the conveyor to the pick-up point. The vision system also inspects the parts for conformity, and rejects any that do not meet the specifications provided by the customer. The robot then vacuum-picks the good part, and delivers it to a location according to the recipe selected. The rest of the machine involved picking and placing blister packs or paper cards from a rack, placing a hot glue dot on the paper cards, and unloading the final product onto a cleated conveyor. The entire sequence is controlled by a PLC, which coordinates with the robot and vision systems. A large HMI was included to provide machine and alarm status, allow recipe selection, and provide troubleshooting controls when necessary. To add packaging capability to an existing production machine. Vision system inspection to endure compliance with strict tolerances.